Problem Knowing that marketing your business is critical but don’t have time? Make a start We can help identify your businesses marketing needs and help create a timely plan with a sensible budget. Benefit Feeling rest assured that your business is being support by Marketing professionals, giving you back time to focus on the areas that need you. 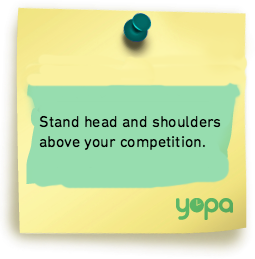 If you know you should be marketing but find yourself short of time, YOPA can take care of these tasks leaving you to focus on your business and customers. Do you have a marketing plan but no time to make it work for you? Perhaps you haven’t got around to making a plan at all yet. Whatever your situation, our Marketing and Design team understand that as a small business you may need some support from blogging to a new website design. Marketing has changed considerably over the past decade, with new channels and trends popping up all the time it can be hard to keep up, especially if you don’t have access to a large budget or a dedicated marketing department to help you out like larger companies have. We offer a wide range of affordable marketing services from branding to brochures, perfectly tailored to the needs of small business owners – giving you access to professional support that allows you to compete with larger companies. Whether you are starting completely from scratch and need help with a new logo and stationery, or you’re already established and are need of a brand update creating eye-catching pdf’s, we can help with everything the list is endless. We will make sure you are seen and heard by the right people, in the right place, at the right time. By letting YOPA take care of your marketing needs, we can take the strain and help you with rebranding, creation of company literature and promotional items, website and social media development right through to one-off marketing campaigns and project management. Delegating to YOPA will help you spend all day doing what made you start your own business in the first place. Relax with the knowledge that we love doing the groundwork for SME’s marketing and what seems like a grind to your is a piece of cake to us. So don’t delay and let us support and develop your business today. Our marketing support can be easily tailored to suit your needs – no job is too big or too small. Every business is unique so we’re more than happy to discuss your specific requirements in detail, to offer the very best solutions for you. Why not get in touch for a FREE consultation and see how we can start helping you? Please call us on 01926 355777. “Working with YOPA on our new website has been great. I have been exceptionally pleased with the service they have provided. From our first meeting, they really understood what I was looking for in a product focused website and they took the time to make sure the end result was exactly what I wanted, guiding us through important decisions. We felt the design team at YOPA were very professional with an exceptionally high standard and really cared about our business and industry presence. Thank you!”.